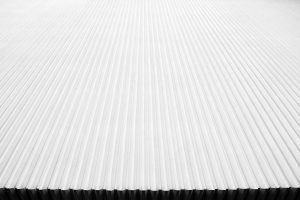 Home Latest Roofing News & Offers Heat reflective paint – is it effective? Heat reflective paint – is it effective? Heat reflective paints are becoming more and more popular amongst roofers, builders and homeowners. It is used to reflect sunlight from the roof, to prevent heat from being absorbed by the typically dark roofing colours, and its use has a range of benefits. Firstly, applying heat reflective paint can help save energy, which is a growing concern for many people. Saving energy will not only help to minimise environmental impacts, but it will also save you money. Heat reflective paint does this by reducing the amount of heat that is absorbed by the roof. When heat is absorbed by the roof it heats the house, which means that in warmer countries energy will be used to power air conditioning units to bring the temperature of the house down. Therefore, if less heat is absorbed by the roof, the house will not get too warm, and less energy will be required to cool down the house. Secondly, heat reflective paint can help ensure your roof stays in good condition, saving you money on roof repairs. Continuous exposure to sunlight can cause alligatoring on your roof, which is when cracks and splits start appearing in the roofing material. These cracks and splits will weaken the roof and can eventually lead to leakages, so costs time and money to repair. When using heat reflective paint, it reduces the amount of sunlight and UV light absorbed by the roof, therefore preventing roof damage. Exposure to sunlight and UV light can also cause thermal movement, when roofing materials move due to changes in temperature from the absorption of sunlight. This movement can cause stresses and weaknesses in varying places across the roof, and lead to roof leakages. When heat reflective paint is used on your home roof, the amount of sunlight absorbed will greatly reduce, mean temperatures will fluctuate less. Therefore there will be less thermal expansion, and so your roof will not develop further weaknesses if you apply heat reflective paint. 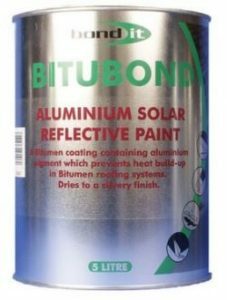 We have a range of aluminium reflective paints from brands such as Cromar and Bond It, which are designed specifically to reduce heat absorption on metal roofs, particularly those where bitumen, steel or iron surfaces are exposed. 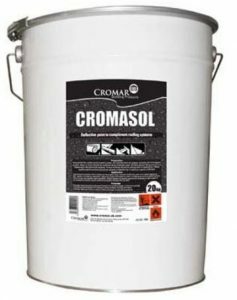 We also have some high performance reflective paint by Cromar which is particularly for use on bituminous roofs. If you’re looking for roofing advice, queries or roofing products and accessories, don’t forget to take a look at our range online or give our expert team a call on 01752 692 760.